Paul had severe depression for 20 years and now he’s happy thanks to EFT tapping therapy. Karen Degen talks about how we create a subconscious list of things we shouldn’t do, have or be. The problem is that these ‘shouldn’ts’ disguise themselves and have various aliases so we don’t always recognise those thoughts. 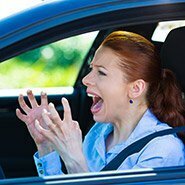 These ‘shouldn’ts’ severely limit our lives and keep us trapped in unhelpful behaviour patterns. Karen Degen on the Style TV show (CTV) talking about the brick wall on our road to success. 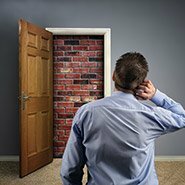 How our limiting beliefs can create barriers to success and improved finances. Karen shares a great tip about how you can tell if you have a block to earning more money. Karen Degen talks about the masks we wear i.e. the persona we show the world. We show people who we want them to see and who we think they will find acceptable, rather than who we really are. Why we stay in relationships that make us unhappy. What keeps us there and what stops us from making a change. What we can do to ensure we are free to follow our heart. Karen Degen interviewed on CTV talking about why most diets don’t work and what you can do about it. Beat the winter blues. My latest TV interview thanks to On The Land. No tips about hot soup and warm socks here! Instead I share ways of having happy thoughts and happy feelings even on the worst of days when winter drags you down. Karen Degen is interviewed about insomnia. The two main reasons for it and what you can do to get a good night’s sleep. 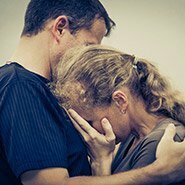 Why do people commit suicide? 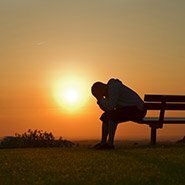 On this week’s show Rob Cope-Williams talks to Karen Degen who says there are two reasons, and has some insight on ways to help people who may be feeling suicidal. Karen Degen being interviewed on the farming show On The Land. Talking to host Rob Cope-Williams about depression, how to sleep at night, and simple self cures. Karen Degen is interviewed by Rob Cope-Williams on his TV show On The Land. They talk about what stops us being happy, what we can do to change that, her book Heightening Your Happiness, and about the form of Energy Psychology known as EFT. You are held back by your thoughts, beliefs and emotions. As you change these you change your life. There is a way for you to be different. Energy Psychology, particularly EFT is the way for you to easily make changes in your life and be a better version of you. With EFT you will gain emotional freedom, inner peace, love, self acceptance and you will be at peace with ‘what is’ in your life. 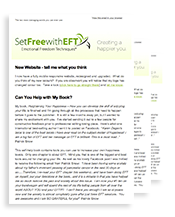 Set yourself free with EFT. 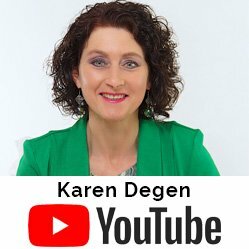 Interview by Elly McGuinness, author of Fat Burning for Good where Karen Degen talks about how your thoughts and emotions affect your eating behaviour and your weight.